Entering its 19th year, National Student Volunteering Week celebrates the impact of student volunteers and encourages students to engage with charitable opportunities in their local area. The campaign demonstrates how when students are supported to learn about issues and provide solutions to tackle social challenges, both the students and the community benefits. Be a part of this national campaign! 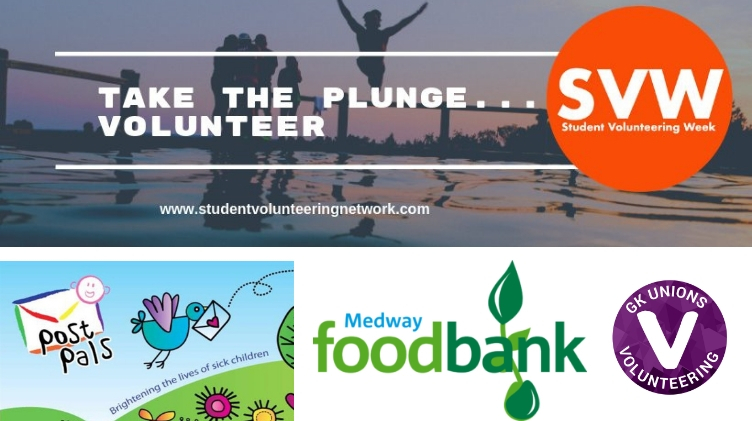 During Student Volunteering Week (11th-17th February), GK Unions and Medway RAG are running activities on campus every day to provide opportunities for you to volunteer. On Monday, we are running Post Pals, a chance to be creative and help brighten a seriously ill child’s day. On Tuesday, we are assisting the Chaplain at Bargain Corner, a space selling good quality pre-loved winter clothing, bedding and household items for students at affordable prices helping promote upcycling and save the planet. On Wednesday, we are cleaning up the campus with a Litter Pick from 10am and on Thursday we will be doing a Bucket Collection for the Medway Food Bank from 2.30pm. On Friday, we have an Arts Marathon! Why do you volunteer? Express yourself through an all-day art marathon run by the Student Volunteering Committee. Every opportunity is entirely drop-in and feel free to come along purely to find out what we do and ask any questions. Don’t forgot that any volunteering you complete on or off campus during Student Volunteering Week (and at any other times!) can be logged on our Toolkit to go towards your KSCV/GSCV award. If you would like anymore information or help logging your hours simply email volunteering@gkunions.co.uk or pop into the Student Hub in person.